If you’ve ever traveled abroad, you might have been shocked by the way other countries treat their eggs: left-out on counters and sold unrefrigerated at stores and markets. We Americans keep our eggs cold—and are taught to fear eggs that have come to room temperature—so why hasn’t the rest of the world died from a mass outbreak of egg poisoning? The U.S. is one of only a few countries that mandates that all eggs be thoroughly washed and sterilized before distribution. This may not seem like a big difference, but America’s obsession with keeping food squeaky-clean strips away one of the egg’s chief defenses against bacteria: the slick coating of cuticle or bloom that envelops a freshly laid egg. Without this cuticle, an egg is more prone to harbor microorganisms like salmonella, and the FDA therefore requires eggs be kept at or below 45 degrees Fahrenheit to inhibit bacterial growth. 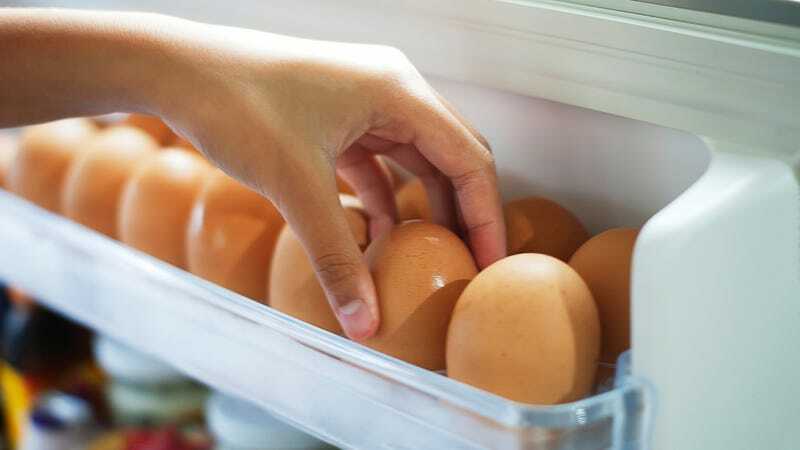 While a few other countries like Australia and Japan also perform this same sterilization process (and therefore also require refrigerating eggs) most of the world gives them only a light scrub, removing dirt without destroying the bloom. Why is preserving the cuticle so important? An egg shell is of course the physical barrier between the inside of the egg (which must stay bacteria-free) and the outside world (which is a gross cesspool of germs and disease), but it contains many tiny pores that allow air to move into and out of the interior (key for allowing an embryo to develop into a chick). The cuticle layer surrounding the shell contains antimicrobial proteins and carbohydrates which plug these holes, but in such a way that air can migrate through while microorganisms cannot. If this cuticle is preserved, then any bacterial contact will be confined to the shell where further growth is limited. If the cuticle is damaged, then bacteria is more likely to penetrate the egg and multiply, especially in warm environments. Since this barrier is so important, some US egg distributors even spray eggs with a thin layer of mineral oil to “re-seal” the shells. Is America right, or is the rest of the world? Neither method is foolproof, but rest assured—egg-based salmonella outbreaks remain rare under both systems. Even if bacteria penetrate the shell, further antimicrobial proteins in the egg white can fight back, and cooking an egg will kill off any harmful bugs. And what about eating raw eggs? Since the outside of the shell is the most likely contamination point, follow chef Jacques Pépin’s suggestion and crack eggs on a flat surface rather than a corner or sharp edge in order to minimize shell contact with its interior. That’s sage advice no matter how you keep your eggs.